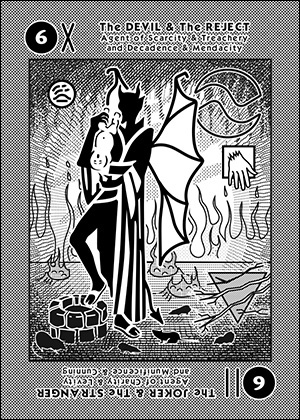 A Devil holds an infant upside down over a fire pit. His talons inscribe demonic symbols onto the head of the innocent. Capricious passivity may save the child, but don't count on it. Our host is not to be trusted at all. His alienation from society breeds animosity. He only wants to degrade and pervert others to his level. He is a bad influence. A Reject, influenced by evil, has been abandoned. He lives in poverty amid crumbling ruins. He is starving. Nobody wants him, he is a throwaway child. He turns to a life of crime. Things just get worse and worse, making more and more enemies. He wastes every opportunity. This is a card for waste, decline and the wake of destruction some people leave behind them.